Presentin a rare, remarkable, and not very usual for Russia phenomenon when a well-known and popular rock, ethno, and electronic music festival was held in a small depressed village with no real economy and no jobs, and when the happening was locally initiated. The White Noise festival was held in the village of Chupa on the White Sea, at the north end of Karelia, 20 miles from the arctic circle (66°33), on the Medvezhka (bear) peninsula. Performers and guests came here from Moscow, St. Petersburg, Karelia, the Murmansk region, and other places. This year there were about 2000 of them living in tents all over the peninsula. The organizers set up several cafes (including a vegetarian one with Indian food), brought potable water, installed toilet facilities. Also a fire show, art shows and exhibitions, a performance by jugglers, a fair of hand-made products, sea canoe rides, tours of the coast on motor-boats and sailing yachts, and diving were part of the festival. 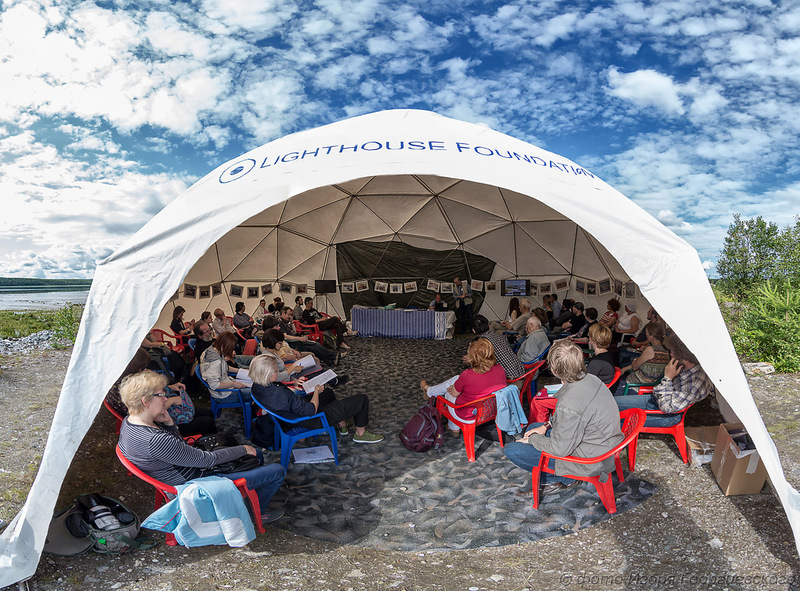 The festival’s main sponsor was the Lighthouse Foundation fund (http://www.lighthouse-foundation.org/). Festival’s site: beliyshum.ru. Next year’s dates will be announced there, and of course here on kandalaksha.su. Out of hundreds of photos of the event floating around images by Maria Brusnikina appeared to us to be most revealing. Below are several of them. All photos of Maria from the White Noise are here >>. Taken and processed by Alexandra during our first walk around the settlement yesterday. The International Scientific and Practical Conference “Nature and Cultural Inheritance of the White Sea Region: Preservation and Development” is taking place in Chupa next weekend, Friday to Sunday. Alexandra is presenting her article on the legend of St. Cuthbert as the author of first Eider Duck protection laws. “Nature and Cultural Inheritance of the White Sea”. Chupa, Karelia, July 17-19 2015. A scientific and practical conference “Nature and Cultural Inheritance of the White Sea: Perspectives of Preservation and Development” is going to be held from July 17 to July 19 2015 on the Vershinny Peninsula in the Village of Chupa, Karelia. Organized by the “Basin Council of North Karelian Coast” with support from the Lighthouse Foundation international fund and International Fund for Animal Welfare. Inter-regional yacht competition will be held June 27-July 3 near Chupa organized by the Sea Yacht Club of Chupa. The regatta starts with a qualifying commission at Sonostrov on June 27 2015. Then the regatta moves through Umba (June 29), and Kandalaksha (June 30). A so-called “port race” will be held in Kandalaksha for the Kandalaksha Administration prize. The place to observe the race is from the Monastyrski Navolok (east end of Kandalaksha). The race ends on July 3 in Chupa, Karelia. Participants, spectators, and event sponsors are invited.